Friday, 15 March, is World Sleep Day, an annual, global call to action about the importance of healthy sleep. Elinor, one of our diplomats working in Libya, writes about how she finds time to sleep, exercise and de-stress while working in a conflict zone. Being part of the Diplomatic Service means being globally mobile, and that brings with it particular challenges for personal wellbeing. Change, uncertainty about where you might be heading next, and distance from friends and family all draw on resilience. And for our staff who work in isolating, insecure or complex environments, the challenges are even greater. Sharing personal tips and techniques for how to survive and thrive in these situations is one of the ways that the Foreign & Commonwealth Office promotes staff wellbeing. I am in the political team in Tripoli, which involves reporting on security, human rights and justice developments in Libya. All conflict posts are different: from massive multinational bases to heavily protected hotels. And everyone has different wellbeing needs. “Figure out what makes you happy, and how you will stay sane”, was the sage advice from my partner while I was packing for this challenging and sometimes all-consuming job. Being able to move is critical to staying healthy. And, for me, it is vital for sleep. As a lifelong insomniac, living in a protective compound in Libya with a 90 second commute to the office means I have to be creative in how I look after my health and wellbeing. We have a well-equipped gym, with an abundance of close protection operators to advise on sit-up techniques. Wireless headphones, my phone and an app with audio exercise classes are a lifesaver in making me stay in the gym, instead of getting bored and wandering off. On lazier days I walk on the treadmill while I read a book. And in the summer I floated around our house’s little pool. There really is an app for everything. I have never been a good sleeper. In 2016, I did a sleep study through the NHS at the Royal Brompton Hospital. The doctor recommended trying to reset my sleeping pattern through an online cognitive behavioural therapy (CBT) programme. 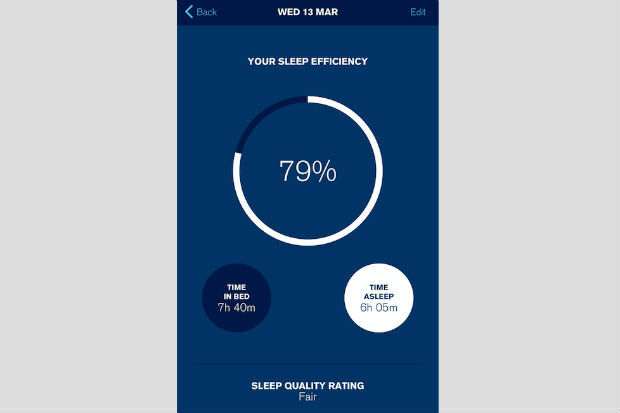 It is now an app that I use to track my sleep and get advice on managing negative thoughts or anxiety at night. But I have also learned to live with uncertainty and accept when things are out of my hands. It is hard to feel stuck and powerless, but taking a deep breath, accepting it, taking each day as it comes and staying flexible is how I stay resilient. Honesty is important when living on compound with our small team. We get a stream of visitors and have a great team of local colleagues during the day, but otherwise have to get on with each other. There is nowhere to escape to, and behaviours are immeasurably amplified. We often get together during the evening. But if we do not want to do something, or need space, that is fine. If something is driving us crazy or is unacceptable, it is better to say so as soon as possible. I make the most of our mandatory breaks between rotations, and recently spent two weeks hiking in the mountains. While having no phone signal was liberating, the rapid onset of exhaustion and mild altitude sickness reminded me that I really just needed some rest. My adrenaline runs out as soon as the plane takes off from Tripoli. Serious fighting broke out just before I returned for my second rotation in September. I got stuck in Tunisia but eventually made it back in. The day after I returned, suicide bombers attacked the National Oil Corporation in Tripoli. As fighting raged, the airport was shut for over two weeks: none of us was going anywhere. We operate in a conflict zone where health and wellbeing takes on a different meaning for everyone who lives or works here. It is difficult, but keeping it in perspective helps. Our local colleagues have to handle these challenges and worse as a matter of routine. Blog posted by: Debra Cheers, 8 March 2019 – Categories: A Brilliant Civil Service, A great place to work.